Find out how you can watch the 2019 World Snooker Championships in any country, full details below. Snooker aficionados, brace yourself, because the most significant event on the snooker calendar, the World Snooker Championships is nearly upon us. For two weeks, from Saturday 20th April, all eyes will be on the legendary Crucible Theatre in Sheffield as the crème de la crème of snooker players do battle to see who will win the biggest tournament of them all. For British snooker fans who haven’t been lucky enough to grab a ticket for their sports showpiece event, the BBC will be offering extensive coverage of just about every game from every round. But if you happen to be outside the UK, keeping tabs on the action might prove a bit more difficult. Unless you use a VPN that is, and if you aren’t sure what that means, don’t worry. In this article, we will tell you everything you need to know to enjoy the 2019 World Snooker Championship, no matter where in the world you happen to be. The 2019 World Snooker Championships will once again be broadcast live and exclusive on the BBC in the UK. Their extensive coverage will be featured on BBC One, BBC Two, and their online streaming platform, the BBC iPlayer. However, their coverage will not be available outside the UK and if you try to log into the iPlayer from abroad you will get an error message telling you the service is not available. The tournament will be shown on TV in some other countries, but in most coverage will be at best limited and if you do try and tune in, you will quickly find yourself pining for the good old Beeb. This is where a VPN comes in. With a VPN, it is possible to access the BBC’s coverage of the World Snooker Championship from anywhere in the world. If you want to know how, keep reading. If you look up the term VPN, you will find that they are an online security and privacy tool which has grown massively in popularity in recent years. How will that help me watch the snooker, you may ask? By connecting your VPN to a server located in the UK, it is possible to fool the BBC iPlayer into thinking you are in the UK even when you aren’t. In this way, you can access all of their snooker coverage no matter where you are. There are a lot of VPNs on the market at the moment and some are much better than others. The BBC has also tried to stop this trick so not all VPNs can unblock iPlayer programmes at the moment. Our top recommended VPN for watching the World Snooker Championships, which we know still works on the iPlayer, is ExpressVPN. They are fast and effective and by some distance the best bet. First, you will need to sign up with ExpressVPN (or your chosen provider). It’s effortless. Just click a link on this page, choose your preferred package, and then follow their onscreen payment instructions. ExpressVPN will only cost you a few pounds a month and they also have a great offer right now which gives you three months for free and saves 49% off the regular price. There is also a 30-day money-back guarantee if you are not satisfied. Next, you will need to download the ExpressVPN app. You can do this on their website by visiting the Products tab on their homepage. If you want to download the ExpressVPN app onto your smartphone or tablet, the best thing to do is search for ExpressVPN in your usual app store. Once you have downloaded the app, open it up and log in. Then all you need to do is connect to a UK-based server. To do this, click on ‘Choose Location’  (or the ‘…’ on a mobile). If you’re using a computer, you’ll need to press ‘Connect’ . If you’re using a phone or tablet, it will connect for you. And that’s it. Now all you need to do is visit the iPlayer website, log-in using your normal log-in details, and then sit back and enjoy the snooker. Or create an account if you don’t already have one. It promises to be a cracking two-weeks of action! When is the 2019 World Snooker Championship? As ever, the 2019 World Snooker Championship is set to be held at the iconic Crucible Theatre in Sheffield. The action starts on Saturday 20th April with the first round matches getting underway at around 10 am (BST). A full two-weeks of action will culminate in the final which will take place across bank holiday weekend, Sunday 5th and Monday 6th May. 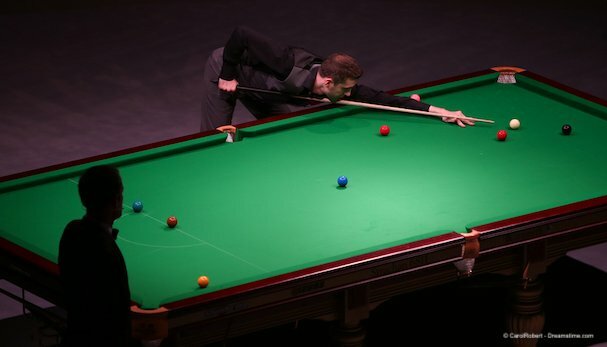 The 2019 World Snooker Championship is set to be one of the most open and unpredictable tournaments in living memory. As always, it is impossible to rule the mercurial Ronnie O’Sullivan out of contention. He is the bookies favourite and if he is in the right frame of mind, he has the talent to beat any other player in the world. If Ronnie isn’t on his game the other names that leap to mind include Judd Trump, Nathan Robertson and Mark Selby. Trump is in the best form coming into this championship, but the pressure of the Crucible means form often goes out of the window. You won’t want to miss a minute of the action at the 2019 World Snooker Championships and in this article, we have explained that you don’t have to, no matter where in the world you are. With a VPN, you can access the BBC’s excellent coverage through their iPlayer from anywhere. 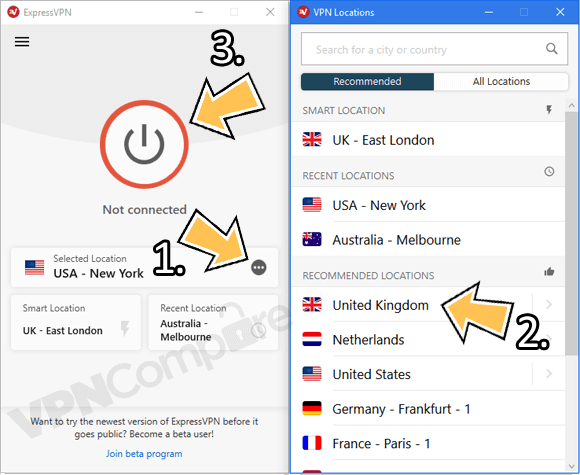 ExpressVPN is the best VPN for the job and in this article, we have explained how all you need to do is sign up, download the app, and connect to a UK-based server. Then sit down and go snooker loopy as the World Snooker Championships gets underway.